The Optoma ZU660 is the perfect 6,000 lumens WUXGA projection solution for museums, boardrooms, higher education, house of worship and smaller entertainment venues. Its low-weight, quiet operation and interchangeable lens options make it ideal for professional installations. Laser phosphor lighting technology eliminates the need for lamp and filter replacements for 20,000 hours of low-cost operation. Advanced colormatching with HSG adjustments enables perfect image blending with stunning colors. Robust input options include HDMI, DVI-D, and VGA for connectivity to a wide range of devices. HDBaseT enables greater installation flexible by supporting audio, video and control over a single CAT6 cable up to 328-feet long. 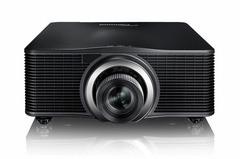 Dimensions: 19.1" x 7.2" x 20"
Mfg Warranty: 3 years or 20,000 hour light source warranty (whichever comes first), 3-year Optoma Express advance exchange warranty on the projector.